Great honour for Nicolas Thomas from PlanetS at the University of Berne: The scientist was selected as part of the imaging team for NASA’s Europa Clipper mission. 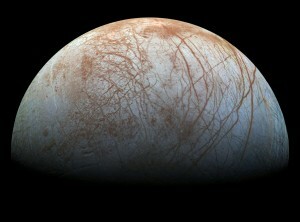 The mission will help to answer the question whether there is life in the oceans of Jupiter’s moon, Europa. Europa Clipper is a mission under study by the US National Aeronautics and Space Administration (NASA) that is supposed to conduct a detailed reconnaissance of Jupiter’s moon, Europa, and investigate whether the subterranean ocean of this icy world could harbour conditions suitable for life. On May 26th 2015 NASA announced the selection of the scientific instruments for Europa Clipper. On board will be the Europa Imaging System (EIS), a camera system to be designed and built by the Applied Physics Lab. of Johns Hopkins University (APL). The science team will be led by Elizabeth Turtle of APL and includes, as one of only two Europeans in the team, Nicolas Thomas of PlanetS and the Centre for Space and Habitability at the University of Bern. «It is a real honour to be part of this incredibly exciting mission», Thomas said. The mission will investigate Europa using a highly capable, radiation-tolerant spacecraft that would perform repeated close flybys from a long, looping orbit around Jupiter. EIS is designed to look at the moon’s icy shell during the flybys and identify where future missions might have access to the liquid water below – Europa’s surface is thought to lie on top of a global ocean more than twice the volume of Earth’s oceans. Thomas: «The moon’s ocean has the elements that we think are necessary for life but, of course, we want to find out whether any life has actually evolved there.» The Europa Clipper mission will launch early in the next decade.